I've recently become a Lush convert. By recently, I mean in the past few months. After my boyfriend bought me a couple of bath bombs (quickly used, may I add), I went out and bought around 10 bath bombs and bubble bars, and I keep going back for more. The only products I have used from Lush so far have been the bath bombs, bubble bars, the Honey Trap lip balm and the Honey I Washed the Kids soap. But, I've heard quite a few positive reviews of other products and have decided to create a "Lush List" containing the ones I'd like to try. Ceridwen's Cauldron £3.99 - Described as a leisurely, slow-melting bath oil. The price of this product puts me off just that tiny little bit, because I get so much use out of the bubble bars (particularly the Comforter, which lasts me ages)! Nevertheless, I will probably end up buying it anyway. Vanilla Fountain Bath Bomb £3.15 - I keep looking at this when I pop into Lush, but never leave with it, which confuses me because I love vanilla scented products! Porridge Soap £2.95/100g - Contains oatmilk. I've picked this up in Lush quite a few times, and I wasn't expecting it to smell so nice considering the less than appealing appearance. But I think this could double up as an exfoliator too, in regards to the texture of the product. It's Raining Men Shower Gel £4.25/100g - I've tried both the Honeybee bath bomb and Honey I Washed the Kids, and in my opinion they smell fantastic. However as the soap didn't last me too long, I'm wondering if this is a better alternative? Sweetie Pie Shower Jelly £2.95/100g - I'm not going to lie, the fact that it's jelly-like is what draws me to this. It supposedly has the same scent as the Comforter, which is pleasant but can be a bit overwhelming for me sometimes. Catastrophe Cosmetic Face Mask £5.75/75g - I'm dying to try a Lush face mask after reading Essie's post about this one in particular. Soft Coeur Massage Bar - £4.50/30g - I adore the smell of this product! I can imagine it can be incredibly messy, but if I end up smelling like that, who cares? 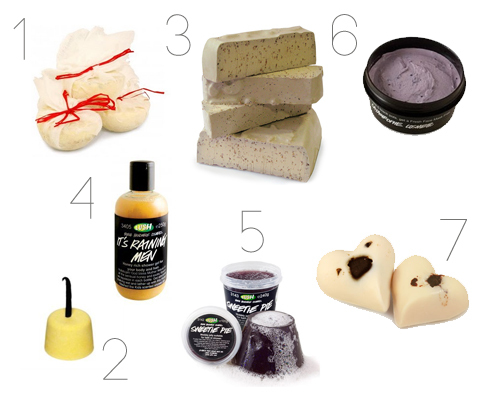 I'm aware I've probably listed 1/16 of Lush here, but if anyone has tried any of these products, feel free to let me know how they are! Ceridwen's Cauldron is amazing! It smells amazing and feels so luxurious in the bath. You should definitely pick it up! I used to work in Lush, and I have to say I love all the products here! If you're going to get a massage bar though, make sure you buy a tin for it! Really like this post! I am a huge lush fan!